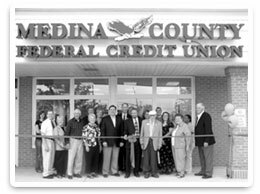 Medina County FCU celebrated its 50th year of serving our community in 2010. Medina County Federal Credit Union is a full-service financial institution dedicated to serving its members. As a not for profit financial institution, our profits are returned to members in the form of better rates and lower fees. Medina County Federal Credit Union has been serving our members for nearly 60 years years and will continue to provide an incredible level of financial service in the future. You can enjoy a full range of banking conveniences including 24-hour account access and other new services consistently being implemented to serve you. If you reside, work, educate, or worship in Medina County, you are eligible for membership in the credit union. You can experience our people helping people philosophy while gaining higher deposit rates, lower loan rates, and exceptional personal service. In addition, you will have the security of knowing that your deposits are insured up to $250,000 by the National Credit Union Administration, an agency of the Federal Government. Medina County Federal Credit Union has a long history of helping our members. We were chartered in 1960 as the Wadsworth Schools Federal Credit Union. In the mid 1960s, the credit union began serving all of the school systems in Medina County and our name was changed to Medina County Schools Federal Credit Union. Now we serve all county residents as Medina County Federal Credit Union. Starting out a small credit union with deposits totaling $50, we have grown to a multi-million dollar, full-service financial institution. We currently rank among the top 25 largest credit unions in Northeast Ohio. Most importantly, we strive to please our members by offering big city services while retaining our small town personal service.